Be IT RESOLVED that in recognition of Mr. Morbito's continuing concern for the University and its students, and for his significant role in the development of the School of Architecture, the architectural library be designated, The Joseph F. Morbito Architectural Library. Today, the Joseph F. Morbito Architecture Library serves over 700 undergraduate and graduate students providing access to a wide variety of print materials, journals, and electronic research databases. Ever cognizant of its services to meet the research and educational requirements of faculty and students, the library continues to play an important support role for the College of Architecture and Environmental Design's mission. 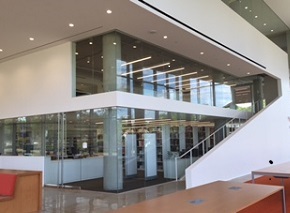 The Architecture Library is also the home of the Belden Brick Materials Library located on the Mezzanine level of the Joseph F. Morbito Architecture Library. Product samples from several hundred manufacturers specializing in items from bricks to upholstery have been added to the library. Also, in the Materials Library, is the Material ConneXion, a leading global platform for innovative and sustainable materials used in all types of design, building, and manufacturing. This collection is available for in-house use by signing in at the circulation desk of the Architecture Library. Please stop by to see and touch the materials!